Try to cook the tempeh in a nonstick pan because the tempeh tends to leave a translucent filmy layer at the bottom of pan. The filmy layer will be more difficult to scrub off if you’re using a pan that is not nonstick. Cut the tempeh into 1/2 inch cubes and transfer them to a food processor. Blend the tempeh for about 5 seconds, until you get very small pieces of tempeh. When you open the lid of your food processor, you will get a good whiff of the odor from the fermented soy beans, and that’s perfectly okay. In a bowl, mix the vegetable broth, soy sauce, maple syrup, garlic powder, and ground coriander. Heat a nonstick skillet or sauté pan over medium heat. Add the tempeh and the broth mixture. Cook for about 8 to 9 minutes, stirring occasionally, until the liquids have completely absorbed into the tempeh. The tempeh might look like it’s ready to be pulled off the stove in 5 minutes, but resist the urge to do so. When you tap the tempeh with the back of a spatula, and you can hear a sound that is similar to walking through puddles in the rain, it means the tempeh is not ready yet. You are probably a few minutes off. Once the liquid has been absorbed, remove the pan from heat. Assemble the lettuce wraps. 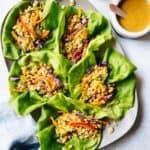 Fill the lettuce leaves with the carrots, cabbage, red bell pepper, and some of the tempeh. Drizzle peanut sauce over the filling and garnish with sliced scallions and red pepper flakes, if you desire. Serve immediately. *SUBSTITUTIONS: You can substitute the maple syrup with sugar. If you are not vegan, you can also use honey or agave. You can also substitute the butter lettuce with romaine or any other lettuce variety you have on hand.